We recently launched a special page on our website dedicated to local oral history. Our first contribution to this initiative is The Main Street Oral History Project: preserving and presenting the remembered history of Gloucester’s Main Street community, through its people, places and buildings. 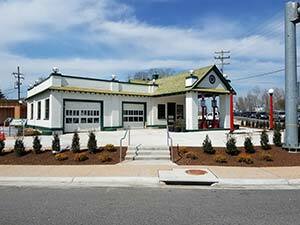 It began with the 1930 Edge Hill Service Station, which is currently being restored into our Center for Archaeology, Preservation and Education (CAPE). We wanted to document the history of this building and property through pictures as well as memories, and knew that many folks in the area had stories to share about how this place figured into their lives. There was a greater need though, to document the history of the wider community, and so our oral history project was born. Through the generous support of the Virginia Foundation for the Humanities, we were able to conduct 25 interviews in 2013. We talked to many remarkable people with amazing memories to share, not just about the service station, but about the broader Main Street community in which they lived. We’ve shared some of these memories in previous blogs, such as Harvey Morgan’ mischief on Main Street at Halloween and the creative courtship strategies of Gloucester’s 1940s and 50s youth. The many buildings that comprise the Gloucester Downtown Historic District are a living testament to the history of this community. Though the project initially focused on the Edge Hill Service Station, our broader goal is to preserve the stories of the people and places of Main Street. Historic document research and archaeological excavations are great ways to explore the past, but we cannot forget the more recent history that resides in our memories. Not only can this type of ‘history’ contribute greatly to our cultural understanding, but it is also the most threatened resource we have. Everyone has relatives (whether grandparents, siblings or cousins) and friends who loved recounting the stories of their lives, but who was there to record them? Sadly, these memories fade faster than the abandoned buildings whose passing we lament as we drive along our community’s byways. But we can capture a part of that history- that is the inspiration behind this project. The new web page contains audio and video clips as well as transcriptions of the interviews. Our goal is to add more information and resources as they become available, and to foster collaboration among other groups and individuals who are trying to gather similar information. History comes alive when we know the players; when we can put names and faces to the people who lived here, the people who built the buildings, and the people who made our community more than just a street in a small town. They created an identity and a cultural landscape that we want to document and preserve, so that future residents and visitors can understand the history of this place that matters. The history of this service station dates to a time when automobiles and automotive travel first entered the public consciousness and changed the ways people experienced and moved across Virginia’s landscape. Service stations became important focal points and community centers, helping define the parameters of an important cultural change in America. Many local residents have memories that extend back to this era, and they can tell us about all the iconic and mundane elements of the remembered past, from building and roadway changes, to the introduction of new businesses, products and technologies, to the stories of interaction between individuals that continue to leave indelible impressions upon people and the landscape. This project advances one of the broader goals of the Fairfield Foundation, specifically encouraging the preservation of and research into local history, and conducting compelling educational outreach that allows the public to learn from and engage with the community’s collective heritage. This is amazing and I am so glad to have found it. I recently completed a project very similar to this that I hoped to continue, I am going to enjoy following your progress!